The Women’s Art Library collection was established in the 1970s to enhance public knowledge of the practice, impact and achievement of women artists. Gifted to Goldsmiths in 2003, it has become the principal collection relating to visual arts in Special Collections. Dr Althea Greenan, Special Collections & Archives Curator, tells us more about the collection and her work here. What is the history of the Women’s Art Library (WAL)? “It was set up by a collective of women artists as the Women Artists’ Slide Library to raise the visibility of women’s art practice. Self-identified artists sent in their slides while artists and scholars documented exhibitions and the presence of women artists in historical collections such as the Imperial War Museum. “In addition to the 35mm slides, there are photographs, posters, videotapes, audiotapes, press cuttings, periodicals, ephemera and books and catalogues which you can find in the Library catalogue. “There are different forms of artists’ archives – from the artistic work journals of Helen Ganly to the performance scripts of Clare Gasson’s ‘The River’. Nina Hoechtl’s artistic research is represented by a gold lamé costume, while the box marked ‘Food Art’ includes Paula Roush’s SOS biscuit, still uneaten, made with former employees at Bermondsey’s Peek Freen biscuit factory in 2004. Can it be viewed online? “The WAL is catalogued like an archive in the Library’s Archive and Textiles Catalogue, and some collections, like the Mail Art box, have been photographed and can be viewed online, item by item. But there is no digitized version of the WAL that I consider a surrogate for the real thing. “Facilitating researchers’ interaction with the materials includes teaching and listening, and a constant exploration of the WAL collection. “I develop the collection by working with artists creating new work and oversee low budget publications like postcards and posters that will give a project an afterlife that becomes part of the WAL story. “I oversee an exhibition programme that has connected the Kingsway Corridor space with Special Collections. It’s seen wonderful exhibitions by women artists in photography, print, installation and film as individuals or in small collectives. “I work to make the WAL and Special Collections available to local art collectives needing support, and recently facilitated a podcasting day for the group Desperate Artwives. “Items from the WAL are often out on loan as critical exhibitions looking at feminist art histories flourish around the country and there are items from the WAL’s Fanny Adams collection currently on show at the De La Warr Pavilion in Bexhill. “The WAL contributed to the excellent Alexis Hunter show here at Goldsmiths CCA. I was delighted to contribute to the show’s catalogue, adding to other articles and chapters that I have written that introduce the WAL collection to scholarly discourse. What upcoming exhibitions will the WAL be hosting? “Narratives of Protest will be in Special Collections during the month of March, featuring textile work by Connie Flynn commemorating the Suffragettes, a slide show of the activist Thalia Campbell’s protest banners, and selections from the Goldsmiths Textile Collection that include Catherine Walton’s triptych, ‘The Demo’. “The exhibition will be an interesting backdrop to the screening on March 15 that is part of Advancing Women Artists around the Globe. “The WAL is also featuring in an exhibition ‘Dark Energy: Feminist Organizing, Working Collectively’ at the Fine Art Academy in Vienna (29 Mar – 25 May) at the invitation of Dr Nina Hoechtl, a Goldsmiths alumna. “There will be two installations: one featuring the project Empowered Printwork by the collaborative Sisters in Print (Ego Ahaiwe Sowinski and Aida Wilde) who worked with the WAL poster collection as part of the Goldsmiths project Radical New Cross. How can staff keep up-to-date with what’s happening at the WAL? As a history student, I have always been fascinated by exhibitions. Learning about the topic of the exhibition is quite remarkable. When I was asked to help with one at my placement, I jumped at the chance. The exhibition I helped for was on the Balkans. Preparation for it took up two of my days at the placement. Firstly, I had to do a bit of research on the Balkans. If I did not know anything about the Balkans, how was I supposed to find sources for the exhibition? Once that was all sorted out, I looked through the special collections and library catalogues to find sources. In order to keep track of the sources I found, I made a table. These tasks marked my first day working on the exhibition. The next day was a lot more varied. I was moving around, which was a nice change from having my fingers glued to the keyboard. I had to physically collect the sources; most of which were luckily in Special collections. The exception were 2 vinyls from the vinyl collection in the library. I spent about an hour trying to find the vinyl collection, only to find one was not available. I actually checked their availability on the catalogue before I went, just in case anyone was wondering. This part was right up my street: I had to analyse the sources to see if they were suitable. I kept most of the sources, apart from a few books and letters. The letters were very difficult to decipher — rich coming from me with my handwriting. When I eventually did decipher them, I found them to be irrelevant. Was it a waste of time deciphering them in the first place? Maybe, but if the source turned out to be detrimental to the exhibition, I would have slated myself for being so lazy. Setting up the exhibition was the highlight of my day. It was a lot harder than I first anticipated. Getting the books to stay on the pages I wanted them to required a lot of DIY on my behalf. I eventually figured out the solution: making a stand out of foam blocks, binding together the blocks and book and then taping them together. I was pretty impressed with my efforts. They were not on the same level as many other exhibitions I have been to, but ju st being able to help with an exhibition was so enjoyable. I tried my best to present the items in an organised and creative way. The images of Balkans dancers were my favourite source. The women resembled dolls and I could hear the instruments, probably because I listened to Balkans music the day before. The other sources used were books on Balkans textiles, a CD and the vinyls mentioned earlier. If asked to help at an exhibition again, I definitely would. It teaches you a lot about how to be selective and creative. When you see the joy the exhibition brings to people, it makes all of the work that goes into it 100% worth it. This blog was written by Danielle, a history at work student, who completed her placement at Goldsmiths Special Collections. Clothing. What comes to mind when you hear that word? Basic necessity? Maybe my livelihood? Everyone has their own view on the matter. The one thing that is certain about clothing is that it is a hot topic. Visiting the textiles collection at Goldsmiths made this more apparent. The Textiles collection is housed in Deptford Town Hall, which I think is a pretty good match. Nothing but beauty surrounded me upon entering the collection. Fabrics, fashion guides and clothing filled the archives. I was blown away by the phenomenal attention to detail that went into the clothing available. The stitching was great, and the prints were stunning. 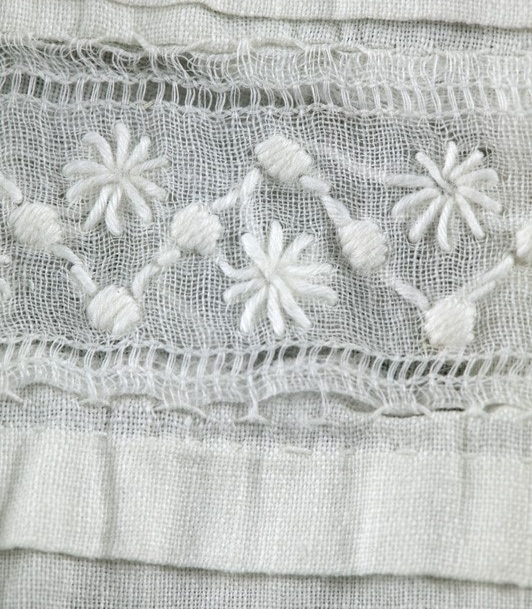 I am particularly in love with embroidered garments, and there were so many. 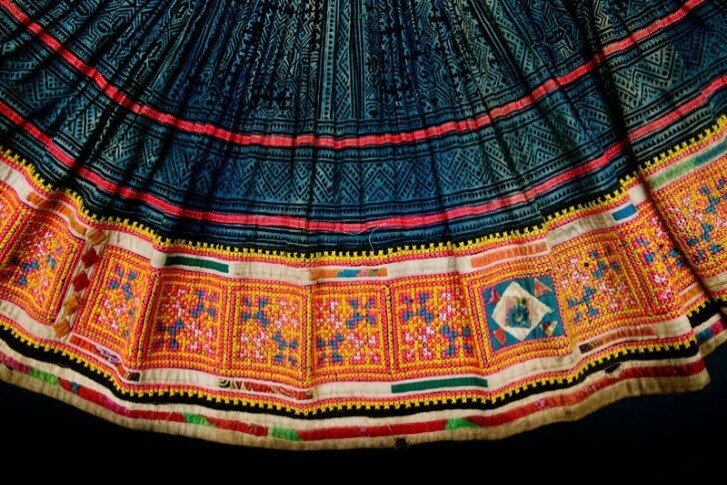 There was one outfit; it looked almost tribal in design. It was beautiful. The embroidery was so elaborate. I wonder if anyone else wanted to wear the outfit — I certainly did. The price of similar clothing in shops can have a maximum price range of well into the thousands. Why should self-expression come with such a high cost? It is because the 21st century likes to associate itself with being very fashion forward. A lot of the prints in the collection are making a resurgence into fashion today. Some never even left — plaid and lace for example. Elegance is the word I would use to link together all of the old fabrics. Would I use that word today? Maybe not as much. I commend people who take risks, but some risks are just too much. I am a firm advocate of body confidence, but what is up with those see-through jeans? You might as well wear only your underwear, especially since they are not cheap. If your see-through jeans are your favourite clothing item, then good on you. Each to their own. The one downside of the clothing in the collection was the limited options available for women in England, predominantly in the 19th century. They all dressed in similar coloured and styled clothes: suede skirt suits with crisp white shirts. There was no real sense of individuality — more a sense of professionalism. That is the biggest change from the 19th century to now. Clothes are more powerful as instruments of our identity. They reflect what we stand for. I wish there was a compromise between the two generations: individuality, decent prices and informed fashion choices. 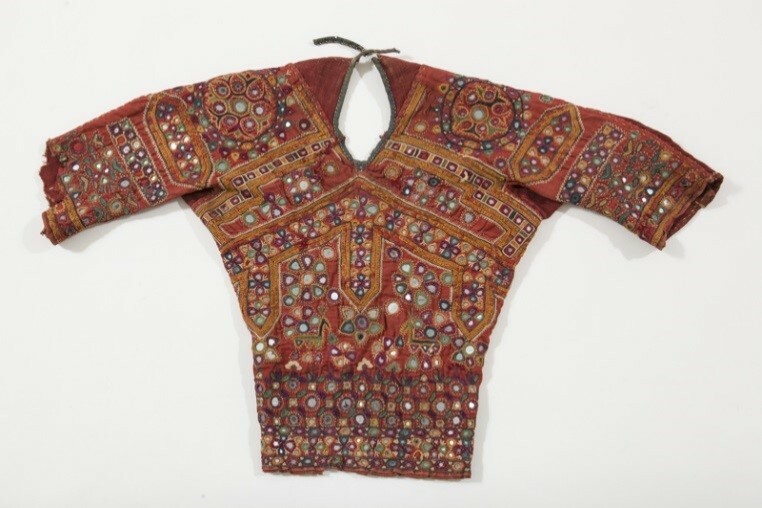 The Textiles collection taught me a lot about the importance of clothing, and moreover, the shift in the use of clothing from the 19th century to now. So you want to be a cataloguer? When I think of cataloguing, the first thing that springs to mind is Argos. I used to go there so many times as a toddler, watching my dad navigate through the pages quickly to buy me masses of toys. Toys I got bored of playing with after a day. I never thought about how catalogues were created at that time; neither did my dad. To be fair, I was 6 and my dad was in a rush. Getting to help catalogue the Women’s Revolutions per minute collection has provided me with a crash course in cataloguing. The Women’s Revolutions per minute collection is essentially a collection of music composed, produced and performed by women. If you have time, you should definitely visit Goldsmiths Special Collections to check it out. Moving swiftly on, the system I use to catalogue with is called CALM. I find that pretty ironic as using it makes you anything but calm. As many people who have catalogued before know, it is not the most stimulating job. It is pretty straightforward — especially since I have catalogued for the majority of my time at my placement. One of the biggest positives of cataloguing lies within its simplicity. After a long day of extensive researching and writing, it is a nice break. I have learnt that if you want to be a successful cataloguer, you have to follow three steps. Number one: get into a steady rhythm. Once you get the hang of cataloguing, you should be able to catalogue fairly quickly. Having a steady pace will also help to build up momentum, meaning you can catalogue more entries. Number two is make sure you fill out fields accurately. When you are in a rush to catalogue as fast as you can, it is easy to make errors. I know that feeling all too well. My cataloguing task at the placement revolves around me changing the field artist to creator, and choosing the option item from a drop down list. After I while, I would get complacent and accidentally add the wrong field or delete a field. The panic added a new lease of life to me, and I managed to correct my errors. So, lesson of the day is do not think you are too good for any task. Even if a task is easy, it does not mean you get to be complacent. The final step is take breaks after a prolonged period of cataloguing. Yes, take breaks. It is often so easy to get lost in the process that you forget to stop for air. As everyone already knows, staring at screens all day is not a good idea. A break away from a task is never a bad thing — it means you will be more alert after your breaks, rather than having to be peeled off of a table from exhaustion. I have a great appreciation for cataloguers: cataloguing is time- consuming. So whenever you are looking through a catalogue and moan because you cannot find an item, think about how a cataloguer would feel when making that catalogue. The Women’s Art Library at Goldsmiths is brimming with amazing material. I have been fortunate enough to browse through the archive material on several occasions. Moreover, the library has been involved with a host of prestigious events. Take for instance the PILLOWTALK exhibition at Tate Modern. The exhibition focused around pillows, engraved with images that reflected the experiences and histories of women in South London. The main aim of the exhibition was to celebrate the historic milestone of women (only those over 30 and who met a property qualification) getting the vote in February 1918, as well as the achievements of women artists. To be able to host an exhibit at Tate Modern to me spells success. I felt a part of the exhibit, even if I did just shoddily place labels on some books used in the event. The Women’s Art Library is a place where you can get lost for hours in the pages of magazines and artists’ slides. I am particularly enamoured by magazines from the company Spare Rib. Why is it called that you ask? Don’t worry, you were not the only one to think that. At first, I thought why would a women’s magazine company name themselves after a Chinese dish? After a bit of digging, I realised the title is fitting for the magazine after all. It was originally used as a joke, referring to the Bible. Eve was formed from the rib of Adam, and so it would be assumed that women were inferior to men. 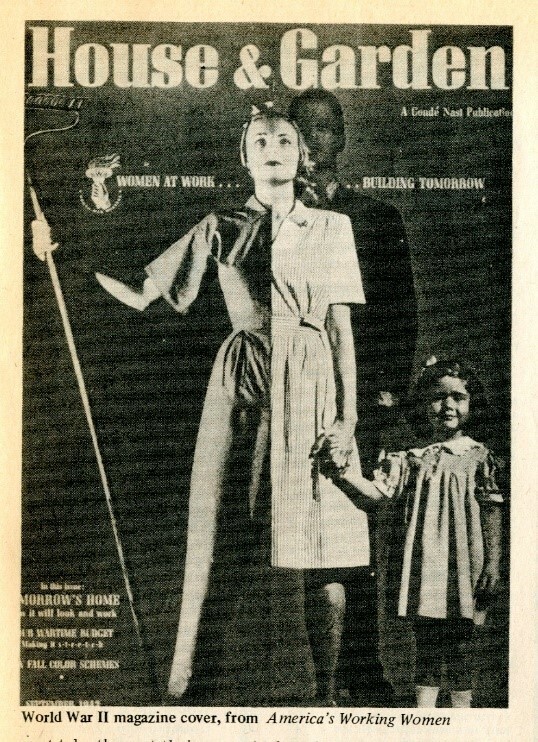 The title stuck as it perfectly reflected what the magazine company was all about: reversing this stereotype. You really have to read some of the magazines- they are beyond empowering. For more information about Spare Rib, please click on the link attached: https://www.bl.uk/spare-rib. Many of the topics broached are so relevant to today. One interview that really drew me in was called: Fat is a feminist issue by Susie Orbach. 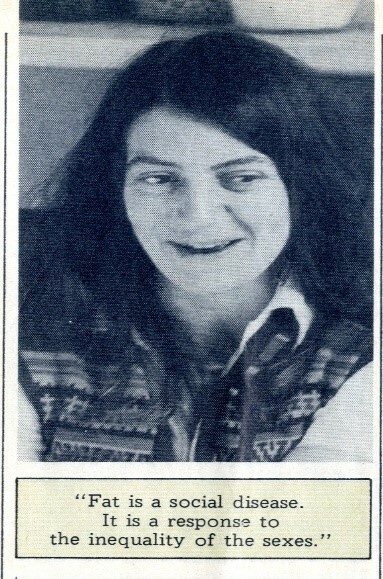 Susie, co-founder of the Women’s Therapy Centre in London, was a compulsive eater. She describes the unfair reality of being fat; being ordered to lose weight by going on every diet under the sun. She also links fat to power. I never would have thought that fat could represent strength, assertion and health until I read her interview. She also stated that you had to look beyond a person’s weight to uncover who they truly are. She argues that fat is commonly used by women as a means of bringing their intelligence to the forefront, instead of their beauty. Many people who lose weight said they felt like a doll, constantly drooled over by herds of men. Why must women try to hide away their physical attractiveness to be taken seriously in the work place? One has to wonder, can’t being self-indulgent be a way of showing you love your body? Restricting yourself to certain foods is just for an artificially constructed image. Feminism is about far more than just physical appearance. It is not as simple to define as many would like to believe. Does feminism mean equality between the sexes, or superiority of women over men? There are internal debates on every topic under the umbrella of feminism. What must a women do to be a feminist? Some would argue that having a family equals a bad feminist. They are letting their family take precedence over their career and life goals. What about if a women’s life goal is to have a family, and since when did having a family mean you were giving up your career? The other side of the argument links infertility to being flawed as a woman. We need to see women as more than just mothers and objects, or feminism really is not for all women after all. The thought-provoking moments that I get every time I visit the Women’s Art Library are insane. It is true that we never really stop to think about topics unless we are exposed to them frequently. Please visit the Women’s Art Library. Bury your head in the wealth of journals, smell the glorious aroma of history and make it a visit YOU won’t forget. 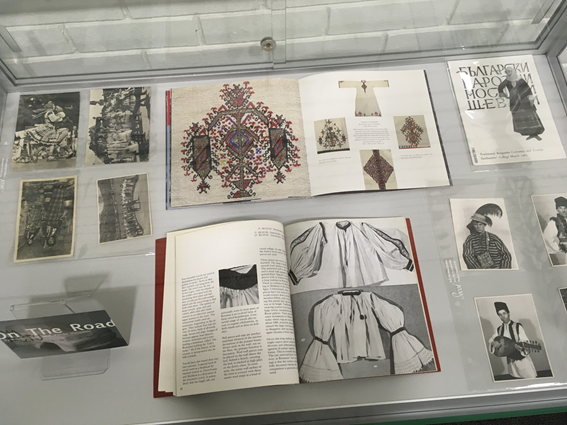 The blog above is written by Danielle, a history at work student, who completed a placement with Goldsmiths Special Collections. ‘on a (m)other’s watch’ is a collaboration between curator Samantha Lippett and mother artist Eti Wade, supported by the Women’s Art Library. The project comprises two public ‘interventions’ within the Goldsmiths campus of previously unseen works by Eti Wade entitled Joscasta and 57 Baths. The project is supported through an accompanying symposium which will provide an international overview of mother artists work. In celebration of Women’s History Month, Goldsmiths Library’s Special Collections & Archives has been taking time to reflect on positive female characters in Goldsmiths institutional history. A previous post looked at Caroline Graveson, the first in the prestigious post of Women’s Vice-Principal of the Goldsmiths Training Department. Following in the stead of Graveson and the gains she made for women in the academic institution, Evelyn Gibbs provided a resolute influence for the teacher training department of Goldsmiths College during the difficult period of the Second World War. Gibbs undertook the study at the City of Art School in her hometown of Liverpool in 1922 before being awarded a scholarship to study at the Royal College of Art (RCA) in London alongside other notables of the period such as Henry Moore and Barbara Hepworth. It was during her time at the RCA whereupon Gibbs would develop an interest in the craft of engraving. Gibbs early work was heavily based on the art of carving images into wood, and this is perhaps what first beckoned her to Goldsmiths College, which by then was drawing the attention of the art world for the so called ‘Goldsmiths School’ of engravers, including the future principal Paul Drury. Her adeptness in the fine craft of engraving would lead her to winning the prestigious Prix de Rome Scholarship in 1929, complete with a scholarship which she would put to use in two years of further study of art in Italy. Her first steps towards academia came after returning to London in 1931 and turning to teaching at a school for handicapped children as a means to support herself. It was this experience that would lead her to write a book on art teaching for children, and featured illustrations by her pupils. The Teaching of Art in Schools (1934) was well received and showcased Gibb’s flair for shaping the learning experience. After demonstrating a natural instinct for teaching others as well as high degrees of artistic talent, Gibbs found herself in demand and Goldsmiths College came calling in 1934. She officially became a teacher-training lecturer at Goldsmiths College. 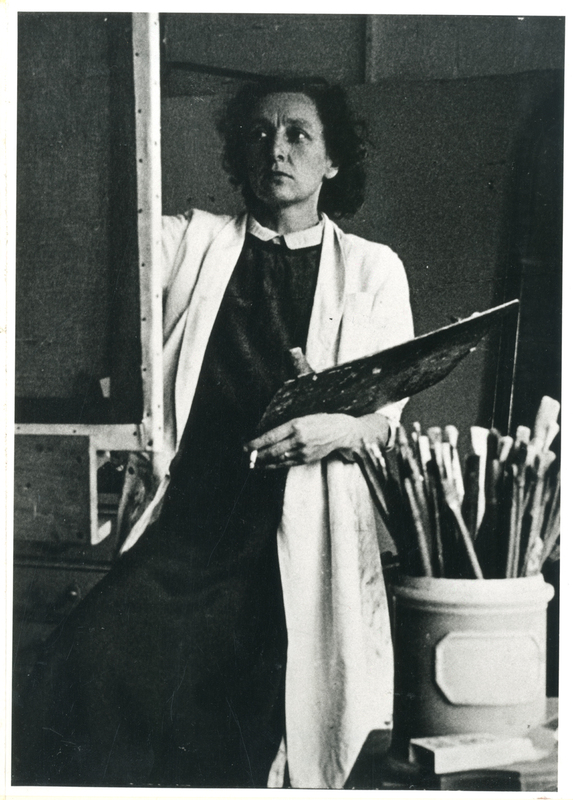 Gibbs settled into Goldsmiths well, and was able to sustain her art practice alongside teaching, and she would make a welcome return to painting. Goldsmiths Art Collection is pleased to hold several artworks by Gibbs, with Spanish Fisherwoman being a prime example of the poignant sophistication she had achieved by then. Spanish Fisherwoman. Image courtesy of BBC Your Paintings. At the outbreak of the Second World War, Gibbs would follow Goldsmiths College when it was evacuated to the safer landscapes of Nottingham. Not one to be perturbed and disheartened by troublesome things occurring in the world at the time, she found the drive to help found the Midlands Group of Artists in 1943, a collective dedicated to fostering the development of experimental artists in the region. The Midlands Group would be instrumental in the assisting several notable artists, including David Hockney and Bridget Riley, a Goldsmiths alumni and influential woman artist in her own right. Evelyn Gibbs sadly passed in 1991, though Goldsmiths College is pleased to be able to honour her memory and gains she made for women in both teaching and the art world. We hold several pieces of Evelyn Gibb’s artwork in Goldsmiths Art Collection, including Spanish Fisherwoman, in various locales around the college. The teaching of art in schools is available for loan and viewing in Goldsmiths Library. Here in Special Collections & Archives we hold much material related to Gibbs in the Womens Art Library, including slide files and Pauline Lucas’s Evelyn Gibbs : artist and traveller (2001), a detailed survey of Gibbs’ life and work. Please contact us here or alternatively call on +44(0)20 7717 2295 for more details. In previous blog posts documenting the activity of Goldsmiths Library’s Special Collections and Archives department, we’ve taken a closer look at the Surrey Docks Studios and the innovative Daphne Oram archive both featuring in our archival holdings. It is a testament to depth of our collection that we are able to contrast the above collections with other vivid acquisitions such as the BANK exhibition file. This particular archive is a myriad of interesting material pertaining to the activity of the infamous BANK art collective, covering the period from 1991 through to 2003. The BANK exhibition file is a compelling assemblage that charts the organisations dissident journey through the boom of the 1990’s London art scene, and sure to be of interest to those interested in the excitement and controversy of the period. 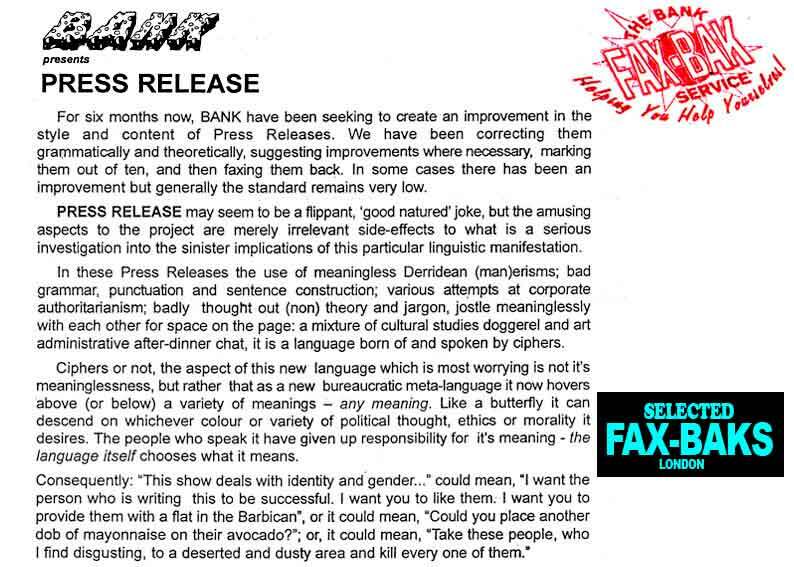 BANK began life in very much the irreverent spirit it would continue in, with founding members Simon Bedwell and John Russell posting fabricated descriptions of fake art show openings in a humorous yet salient critique of what they perceived to be a vapid and commercially orientated art culture prevailing in London at the time. They would take the first steps on the road to notoriety in 1991 and hold their first show proper. 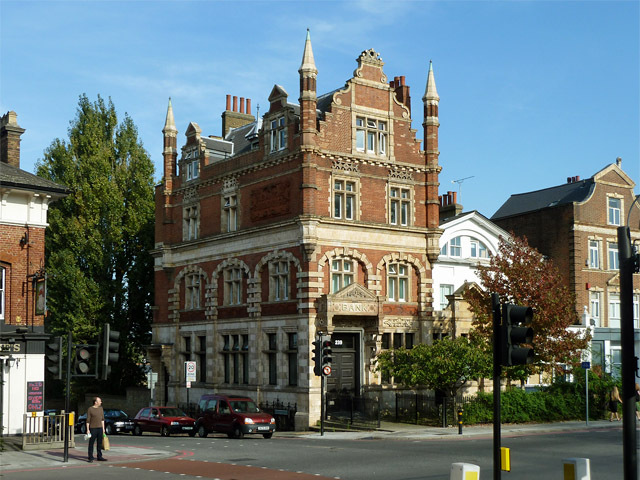 The eponymous BANK emerged within the shadow of Goldsmiths College, as the collective appropriated an old disused bank on Lewisham Way, a landmark of the surrounding area that many former and current students will no doubt be aware of. Old bank on Lewisham Way. Photograph courtesy of Geograph. At the time the area was a dump, deserted at weekends when even the pubs shut; but you could see where it was going. The return of the 80s aspect became the basis for [1994 show] Wish You Were Here; the property market was still in recession but London had a surplus of designer yuppies and boho trustafarians, and Curtain Road is on the edge of the financial district. The DOG and Galerie Poo Poo spaces were both based in disused industrial spaces on Curtain Road and Underwood Street respectively, where some of Shoreditch’s’ busiest bars, numerable loft apartments and a Jamie Oliver’s restaurant now reside. A perusal of the list of BANK curated shows during this period is practically a directory of the most influential artists working today. Bob and Roberta Smith, Martin Creed, Peter Doig, Gavin Turk, 0rphan.drift>, Chris Ofili, John Cussans and Adam Chodzko are just a sample of the notable names that appeared in BANK shows during their ascensions in the art world. Over the decade, BANK would continue to grow as a collective, with a revolving roster of members that included Dino Demosthenous, David Burrows, Andrew Williamson and the current Goldsmiths MFA lecturer, Milly Thompson. The most compelling feature of the BANK collective was how their objectives and work BANK stood in such strong contradiction to the upwardly mobile trajectory of Young British Artists (aka The YBA’s) also existing around the same period. Though the Damien Hirst and Tracey Emin’s (who participated in the spontaneous Viper/BANK TV project with 130 other artists) of the YBA’s were highly successful in bringing British art back into the spotlight, they would shifts the emphasis of art production towards greater financial imperatives. 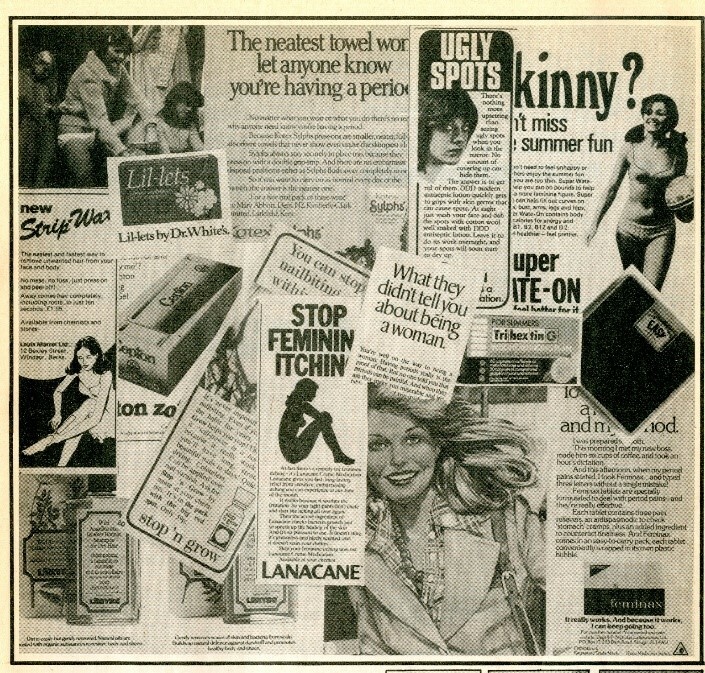 The rise of this money orientated culture was a trend that the BANK collective would consistently take aim at with their unique form of avant-garde satire. As well as putting on shows featuring other artists’ work, BANK also achieved notoriety for their own creative output as they balanced their roles somewhere between that of artist and radical curator. A reoccurring convention between the various members was to exchange the dreary press releases for art shows of the day with various sections annotated and critiqued for satire and personal amusement. PRESS RELEASE. Image courtesy of john-russell.org. Another example of BANK’s abrasive irreverence towards the prevailing mainstream art culture was their White3 show, an overt tongue in cheek reference to the emerging White Cube gallery that hosted many of the YBA’s during their ascension. BANK saw White Cube’s blank and vacant adaptation of minimal monochrome aesthetics as anathema to what they envisaged a vibrant and engaging curatorial space to be. White3 inverted the now ubiquitous display of artworks upon brilliant white gallery walls by creating an actual white cube in the centre of the space and installing an array of ‘spectacles’ around it that included copies of Beowulf and images of popular figures like the Queen, in a sly nod to Guy Debord’s Society of the Specatacle. 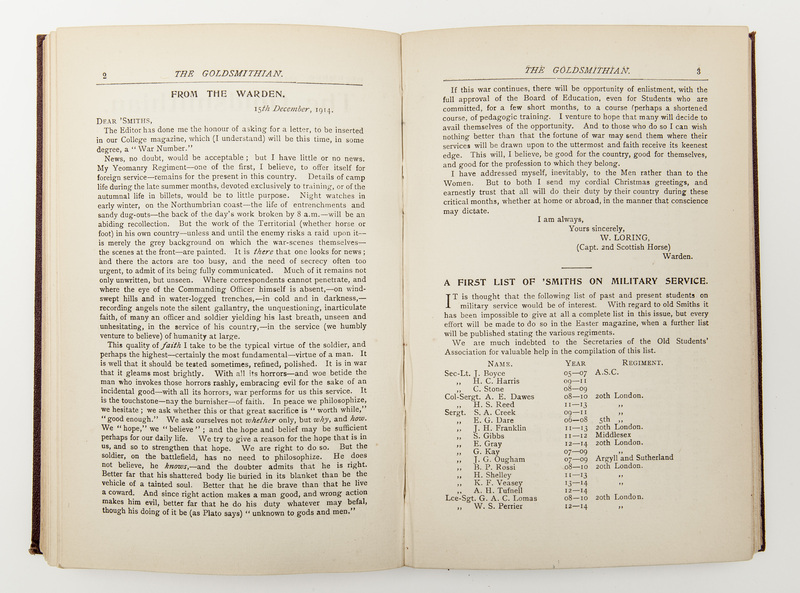 An array of ephemera and material pertaining to PRESS RELEASE and other BANK output can be found here in Special Collections & Archives. Kindly donated by founding member Simon Bedwell in 2006, content includes a self-titled book that includes interviews with the various members and detail information about exhibitions including images, alongside many of the notorious press releases including Zombie Golf, White3 and PRESS RELEASE. A listing of the BANK exhibition file contents can be found here. Get in touch with us at special.collections@gold.ac.uk or alternatively call on +44(0)20 7717 2295 to find out more or arrange collection viewings. Exterior of Surrey Dock studios. From Wikipedia. Much is made of Craig-Martins influence on the students that formed the cluster of famous Goldsmiths Fine Art Alumni such as Damien Hirst and Angus Fairhurst (1966-2008), that would eventually become known as the YBAs (Young British Artists). Famously, whilst Hirst was in his second year of study at Goldsmiths, he would organise and feature in the massively influential Freeze show that would announce the arrival of Hirst and the other formative YBAs onto the art scene with much clamour and irreverence. Not to downplay Hirst’s own ingenuity and precociousness in organising such an important event, but the assistance of Craig-Martin and other Goldsmiths academic staff aided Hirst in finding such a fantastic venue as the Surrey Docks studios in order to debut his conceptual vision. The image below offers a glimpse of the interior of the exhibition, demonstrating how much the Surrey Docks studios had to offer as a space for innovative young talent in the art world. Freeze exhibition in construction. From Damien Hirsts personal website. 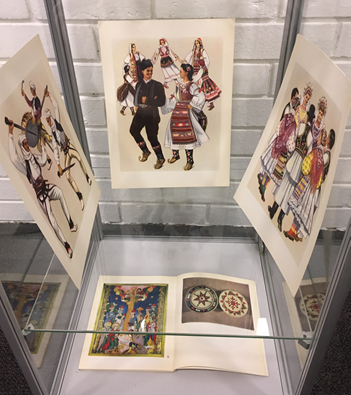 For those interested in the works exhibited in Freeze, Special Collections and Archives hold copies of the exhibition catalogue. We are also pleased to house the Angus Fairhurst Collection, a collection of books that showcases the late artists influences and other interesting details about his life. Contact us at special.collections@gold.ac.uk or alternatively call on +44(0)20 7717 2295 to find out more. Goldsmiths At War: The Goldsmithian. Written exactly 100 years ago today on 15th December 1914, this Christmas letter from the first ever warden of Goldsmiths, William Loring (1865-1915), strikes a slightly somber note for the festive period. Following the outbreak of World War I, Loring takes a moment to reflect upon the difficulty of war and implores Goldsmith students to make the best of peaceful times, a fact made more tragic by his passing shortly thereafter in battle at Gallipoli in 1915, after deciding to rejoin the armed forces as a Captain in the Scottish Horse.